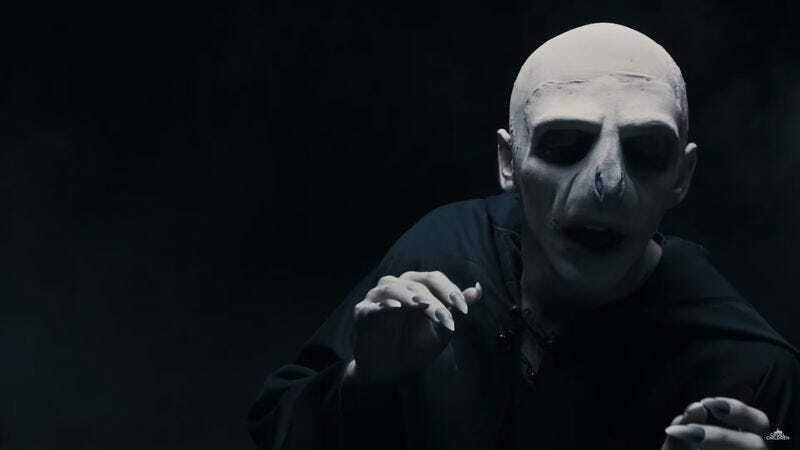 As the chief antagonist of the Harry Potter franchise, both in books and films, Lord Voldemort may be an evil wizard with no nose and a nasty track record of murder, but that doesn’t necessarily make him a soulless monster. If his YouTube followers want him to whisper and make low-volume noises in order to trigger ASMR (autonomous sensory meridian response) reactions, he’s more than happy to oblige. Or, at least, he tries to. His inherent creepiness kind of gets in the way, as does his tendency to skulk around in the shadows with a menacing expression. That’s the premise of “Voldemort’s First ASMR,” a sketch from Cruel Children, a NYC-based web series devoted to “jerks and dummies.” Voldemort, played by Gianmarco Soresi, seems to fall under the “jerks” category. One fish. Two fish. Red fish. I have two wands. My wand and Dumbledore’s wand. Dumbledore is dead. Spoiler alert! Spoiler alert! Dumbledore is dead. Dumbledore is gay. Did you know that? I had no idea. I was shocked. Overall, the video has the effect of humanizing You Know Who and making him more sympathetic. The viewer gets the sense that, in his spare time, Voldemort really is trying to build up a following on YouTube, but he’s not getting the hang of it.